a. ^ English is the official language of at least 28 states; some sources give higher figures, based on differing definitions of "official". English and Hawaiian are both official languages in the state of Hawaii. b. ^ English is the de facto language of American government and the sole language spoken at home by 80 percent of Americans aged five and older. Spanish is the second most commonly spoken language. c. ^ Whether the United States or China is larger is disputed. The figure given is from the U.S. Central Intelligence Agency's The World Factbook. Other sources give smaller figures. All authoritative calculations of the country's size include only the 50 states and the District of Columbia, not the territories. d. ^ The population estimate is of people whose usual residence is within the 50 states and the District of Columbia, regardless of nationality. It does not include those living in the territories (over 4 million people, mostly in Puerto Rico). e. ^ See Time in the United States for details about laws governing time zones in the United States. f. ^ Does not include insular areas and United States Minor Outlying Islands, which have their own ISO 3166 codes. g. ^ Except US Virgin Islands. 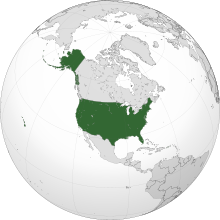 The United States of America (USA), commonly referred to as the United States (US), or America is a country in North America. It is made up of 50 states, a federal district, and five territories. It is one of the world's superpowers. It is famous for its influence over finance, trade, culture, military, politics, and technology. The United States is a federal republic. The federal government is set up by the Constitution. There are three branches of government. They are the executive branch, the legislative branch, and the judicial branch. State governments work very much like the federal government. The executive branch is the part of the government that enforces the law. Members of the U.S. Electoral College elect a president who is the leader of the executive branch, as well as the leader of the armed forces. The president decides whether or not the bills that the Legislative branch passes will become laws, and the president may veto a bill. The President may also make "executive orders" to ensure that people follow the law. Two of the most famous executive orders were President Abraham Lincoln's Emancipation Proclamation and President Dwight D. Eisenhower's order to send soldiers to allow the Little Rock Nine into a school. The president is in charge of many departments that control much of the day-to-day business of government. For example, Department of Commerce makes rules about trade and business. The president chooses the heads of these departments, and also nominates federal judges. However, the Senate, part of the legislative branch, must agree with all of the people the president chooses. The president may serve two 4-year terms. One house is the House of Representatives. The Representatives are each elected by voters from a set area within a state. The number of Representatives a state has is based on how many people live there. Every 10 years, the United States Census Bureau counts the population of the United States. States gain or lose Representatives based on the count. Representatives serve two-year terms. The total number of representatives today is 435. The leader of the House of Representatives is the Speaker of the House, who would become president if the president and vice president were unable to serve. The other house is the Senate. In the Senate, each state is represented equally, by two senators. Because there are 50 states, there are 100 senators. Before the President makes treaties or appoints officials, the Senate must approve them. Senators serve six-year terms. The Vice President of the United States serves as president of the Senate. In practice, the vice president is usually absent from the Senate, and a senator is selected to serve as president pro tempore, or temporary president, of the Senate. Representatives and senators propose laws, called "bills", in their respective houses. A bill may be voted upon by the entire house right away or may first go to a small group of members of that house, known as a committee, which may recommend a bill for a vote by the whole house. If one house votes to pass a bill, the bill then gets sent to the other house; if both houses vote for it, it is then sent to the president, who may sign the bill into law or veto it. If the president vetoes the bill, it is sent back to Congress. If Congress votes again and passes the bill with at least a two-thirds majority, the bill becomes law and cannot be vetoed by the president. The Judicial Branch is the part of government that interprets what the law means. The Judicial Branch is made up of the Supreme Court and many lower courts. If the Supreme Court decides that a law is not allowed by the Constitution, the law is said to be "struck down" and is no longer a valid law. The Supreme Court is made up of nine judges, called justices, who are nominated by the President and confirmed by the Senate. One of these justices, called the chief justice, heads the court. A Supreme Court justice serves until he or she dies or resigns (quits in the middle of his or her term). When that happens, the president nominates someone new to replace the justice who left. If the Senate agrees with that choice, the person becomes a justice. If the Senate does not agree with the president's choice, then the president must nominate someone else. Famous court cases such as Marbury v. Madison (which was decided in 1803) have firmly established that the Supreme Court is the ultimate interpreter of the United States Constitution and has the power to strike down any law that conflicts with it. The United States of America consists of 50 states, 5 territories and 1 district (Washington D.C.). States can make laws about things inside the state, but federal law is usually about things dealing with more than one state or dealing with other countries. In some areas, if the federal government makes laws that say different things from the state laws, people must follow the federal law because the state law is not a law any more. Each state has a constitution of its own, different from the federal (national) Constitution. Each of these is like the federal Constitution because they say how each state's government is set up, but some also talk about specific laws. The federal and most state governments are dominated by two political parties: the Republicans and the Democrats. There are also many smaller parties; the largest of these are the Libertarian Party and the Green Party. People give money to political campaigns that they like, and try to persuade politicians to help them. This is called lobbying. All Americans are allowed to lobby the government, but some have and spend more money than others, or in other ways do more in politics. Some people think this is a problem, and want rules to be made to change it. Since 2009, the president is a Democrat, so Democrats have slightly more power in the federal government. However, there are still many powerful Republicans who can try to stop the Democrats from doing things that they believe will be bad for the country. Also, the Democrats do not always agree with each other on what to do. And if enough people decide to vote against Democrats in the next election, then they will lose power. In a republic like the United States, no party can do whatever they want. All politicians have to argue, compromise, and make deals with each other to get things done. They have to answer to the people and take responsibility for their mistakes. The USA's large cultural, economic, and military influence has made the foreign policy of the United States, or relations with other countries, an especially important topic in American politics, and the politics of many other countries. The country grew from East to West. It conquered and bought lands. The states are divided into counties. Two states do not use the word "county". Louisiana uses the word "parish". Alaska uses the word "borough". The largest city is New York. Other major US cities include Los Angeles, Chicago, Seattle, Miami, Indianapolis, Las Vegas, Houston, Philadelphia, Boston, Denver, St. Louis, Dallas, and Pittsburgh. The Philippines (islands) was once a possession of the United States. Palau, the Federated States of Micronesia, and other Pacific island nations were once governed by the United States as a United Nations "Trust Territory", but are now independent. The U.S. military has bases in many countries. The U.S. Naval base at Guantanamo Bay was rented from Cuba, even after that country had a Communist revolution. The United States has a capitalist economy. The country has rich mineral resources, with many gold, coal and uranium deposits. Farming makes the country among the top producers of, among others, corn (maize), wheat, sugar and tobacco. American produces cars, airplanes and electronics. About 3/4 of Americans work in the service industry. The United States of America has people of many different race and ethnic backgrounds. 80% of the people in the United States descend from European immigrants. Many people are descended from Germany, England, Scotland, Ireland, Africa, and Italy. 13% of the people in the United States are African-American. Most of them descend from the African slaves that were brought to America. Asian-Americans make up only 5% of the population in America but make up a bigger portion in the west coast. For example in California, Asian-Americans make up 13% of the population of that state. Hispanic-Americans or people of Latin origins make up 15% of the nation. The original peoples, called Native American or American Indians and Inuit (Eskimos) are a very small group. The social structure of the United States has a big range. This means that some Americans are much, much richer than others. The average (median) income for an American was $37,000 a year in 2002. However, the richest 1% of Americans have as much money as the poorest 90%. 51% of all households have access to a computer and 41% had access to the Internet in 2000, a figure which had grown to 75% in 2004. Also, 67.9% of American families owned their homes in 2002. There are 200 million cars in the United States, two for every three Americans. The debt has grown to over $16,000,000,000,000. Native American religions included various animistic practices, including reverence for nature and spirits. There are many different religions in the U.S. Statistically, the largest religion is Christianity, including groups such as Catholicism, Protestantism and Mormonism. Other religions include Hinduism, Islam, Judaism, Unitarian Universalism, Wicca, Druidry, Baha'i, Raelism, Zoroastrianism, Taoism and Jainism. Religions which were founded within the United States include Eckankar, Satanism and Scientology. The United States is one of the most religious countries in the Western World, and most Americans believe in God. The number of Christians in the U.S. has gone down. 86.2% called themselves Christian in 1990 and 78.4% said this in 2007. The others include Judaism (1.7%), Islam (0.8%), Buddhism (0.7%), Hinduism (0.4%), and Unitarian Universalism (0.3%). Those who have no religion are at 16.1%. There is a large difference between those who say that they belong to a religion and those who are members of a religious body of that religion. 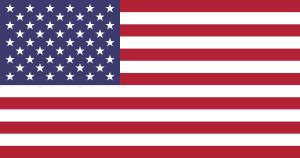 The United States does not currently have an official language, although the United States Congress has considered officially designating English as such for many years, since it is the most used language, and the language in which the United States Declaration of Independence and United States Constitution are written. Spanish has increased in usage in certain sectors of society, due to a flow of immigrants—especially from Mexico and Cuba. French is also a main language in parts of Louisiana because France once owned the area as a colony. (4th Thursday in November) Thanksgiving Gives thanks for God's blessings, and the autumn harvest, and marks the traditional beginning of the "holiday season"
The American flag is made up of 50 stars on a blue background, and has 13 stripes, seven red and six white. It is one of many symbols of the United States like the Bald Eagle. The 50 stars represent the 50 states. The red stands for courage. The blue stands for justice. The white represents peace and cleanness. The 13 stripes represent the 13 original colonies. ↑ "United States". The World Factbook. CIA. September 30, 2009. https://www.cia.gov/library/publications/the-world-factbook/geos/us.html. Retrieved January 5, 2010 (area given in square kilometers). ↑ "U.S. POPClock Projection". U.S. Census Bureau. http://www.census.gov/population/www/popclockus.html. (figure updated automatically). ↑ 6.0 6.1 6.2 6.3 "United States". International Monetary Fund. http://www.imf.org/external/pubs/ft/weo/2013/01/weodata/weorept.aspx?pr.x=51&pr.y=7&sy=2012&ey=2012&scsm=1&ssd=1&sort=country&ds=.&br=1&c=111&s=NGDPD%2CNGDPDPC%2CPPPGDP%2CPPPPC%2CLP&grp=0&a=. Retrieved April 16, 2013. ↑ "Income, Poverty and Health Insurance Coverage in the United States: 2011". Newsroom. United States Census Bureau. September 12, 2012. http://www.census.gov/newsroom/releases/archives/income_wealth/cb12-172.html. Retrieved January 23, 2013. ↑ "Human Development Report 2013". United Nations Development Programme. March 14, 2013. http://hdr.undp.org/en/media/HDR2013_EN_Complete.pdf. Retrieved March 14, 2013. ↑ Feder, Jody (January 25, 2007). "English as the Official Language of the United States: Legal Background and Analysis of Legislation in the 110th Congress". Ilw.com (Congressional Research Service). http://www.ilw.com/immigrationdaily/news/2007,0515-crs.pdf. Retrieved June 19, 2007. ↑ "United States Facts - Ten Interesting and Unusual United States Facts". Geography. http://geography.about.com/od/unitedstatesofamerica/a/unitedstatesfacts.htm. Retrieved 9 August 2013. ↑ "2014 Federal Holidays". U.S Office of Personnel Management. http://www.opm.gov/policy-data-oversight/snow-dismissal-procedures/federal-holidays/#url=2014. Retrieved 26 January 2014. This page was last changed on 18 December 2014, at 05:46.